1996 is the year of Time Commando: A 3d Beat 'em Up, in which the player embodies a time traveler guy who goes through time to face different enemies in different eras. The second title is more popular: it is Command & Conquer: Red Alert. In this episode, the scenario includes a time machine that changed the course of history. Albert Einstein developed the Chronosphere, and uses it to travel back in time to 1924 to meet Adolf Hitler. Employing an apparatus similar to its Chronosphere miniaturized, he sends him in a parallel dimension. Einstein's plan worked, the Nazi Germany did not hatch, the Second World War did not erupt. But paradoxically, it was the USSR that rises excessively in power: with the absence of a powerful Germany, Stalin goes insane and annexes numerous territories. Allies are organizing to counter the Soviet supremacy... and another war is triggered, defeating Albert's plan. In 2000 is developed the first episode of a very original series of FPS: it is Timesplitters. In each of the three games of this saga, player embodies multiple characters at different times. The Timesplitters are time travelers... but rogue ones. It's up to you embody the heroes who will annihilate them, and avoid the chaos of the human race. 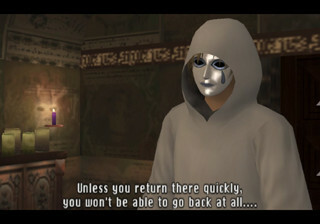 Konami published in 2001 Shadow of Memories. The action takes place in Germany. You play Eike, a young German guy whose destiny will forever change... As you walk in the street, you fall on the ground, dead. You find yourself in a strange room together with a demonic being. He proposes you a deal: he offers you to go back in time a few moments before your death, to try to change your destiny ... But this test is fraught with pitfalls, because you can't escape death so easily. Eike will have to defy death several times in various circumstances, and repeatedly use time travel to change events in one way or another: it will be up to you to make the right choices. An exceptional game, exciting, and full of surprises ... Probably what was done best in the genre! Prince of Persia: Sands of Time offered the player a short interaction with time: the ability to slow down or get slightly back in time for a short time by using a Dagger packing that power. The plot is excellent, with the magical artifacts, each featuring special effects, with some that are overpowered, even uncontrollable when they interact. The time control is a recurring frame in the timeline: a game to play absolutely, for any lover of incredible intrigues with backdrop of time travel. In very good eponymous saga from Capcom (Resident Evil-like in feudal times in Japan), Onimusha 3 (2004) puts Samanosuke in scene, the hero of the previous game. While he is about to face the foul Nobunaga once again, our hero is sucked into a temporal rift which projects him in the twenty-first century, in the heart of Paris. The game is good, but once again the plot is only an excuse to give a little variety to the fighting scenes. So ends our little overview about video games related to time travel. As you have seen, we can distinguish two categories in these games: those that use Time Travel as a part of their scenario, having no real influence on your actions or the conduct of the game, and most interesting ones in which time travel is a key element of the story. If you want to try some of these titles,Here's a selection of games that in my opinion, are the most interesting in relation to the scenario, and the importance of time travel to the heart of their plot.